If your car is just starting to overheat, you might be able to avoid a complete breakdown by turning off the air conditioner and turning on the heat. This tactic blows hot air from the engine into the car, and while it’s uncomfortable, it could help cool the engine and buy you some operating time to get to a mechanic. Nothing’s worse than when an engine overheats on the highway, but no matter where you are when the gauges start to slip into the danger zone, it’s imperative to get to a safe spot. Pull all the way over onto the shoulder or into the median and immediately call AAA or the local highway authorities to alert them of your position. Once you’re parked, turn off your car and pop the hood to help the engine cool off faster. Try to pull the hood release from the inside of the car and avoid touching the engine - hot steam can come billowing out and when it’s overheated that’s extremely dangerous. It takes at least 30 minutes for an engine to cool completely. Call your local mechanic and explain what’s happening - they can give you professional advice as to whether it’s safe to attempt to drive the car to the shop or if you should get a tow. If you’re unsure of the cause of the overheating and you’d rather leave diagnosis to the professionals, now is the time to get help. The simplest way to narrow down the reasons an engine might be overheating is to look for coolant leaks. Once the engine is completely cool (and NO sooner!) check the translucent tank to see if you’re low on coolant. If the tank is empty or dripping, you probably have a leak that’s caused the overheating. If there is plenty of coolant in there, then the cause is mechanical. If you’re missing coolant, you’ll need to put more in in order to be able to drive the car to your mechanic’s shop. Again, make sure the engine is completely cool before opening the radiator cap. Use a spare rag to grip the cap and twist slowly. Back up and tilt the cap away from you as you take it off to make sure any steam doesn’t burn your face. Refill with coolant and then head to the auto repair shop to get it fixed! DO NOT open the radiator cap while the engine is still hot. The highly pressurized liquids can splash and result in whole-body burns. It’s extremely dangerous! Wait until the engine is cool to add more coolant. DO NOT pour cold water or coolant into a still-hot radiator. This can cause the entire engine block to crack. That’s a much more expensive fix! DO NOT drive long distances without spare coolant on hand. Keep spare coolant in your trunk for emergencies! You will be glad you did so the first time you have an overheating engine. 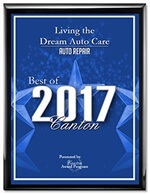 As always, depend on Living the Dream Auto Care for timely, professional car repairs, including instant help for your overheating engine. We are here for you!